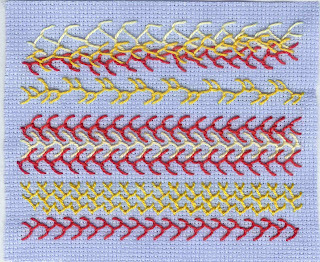 Here's my feather stitch sampler for TAST. I've always done it irregularly in the past and was a bit lazy about counting accurately but as I got into it I liked the regular patterns so tried a bit harder! When I was actually stitching I had it held the other way up and was stitching in columns, some up and some down. But for the yellow band second from bottom that is actually short columns side by side across the piece to give quite a different look. i love all of your samples especially the algerian eye and detached chain. those rise above the mark!